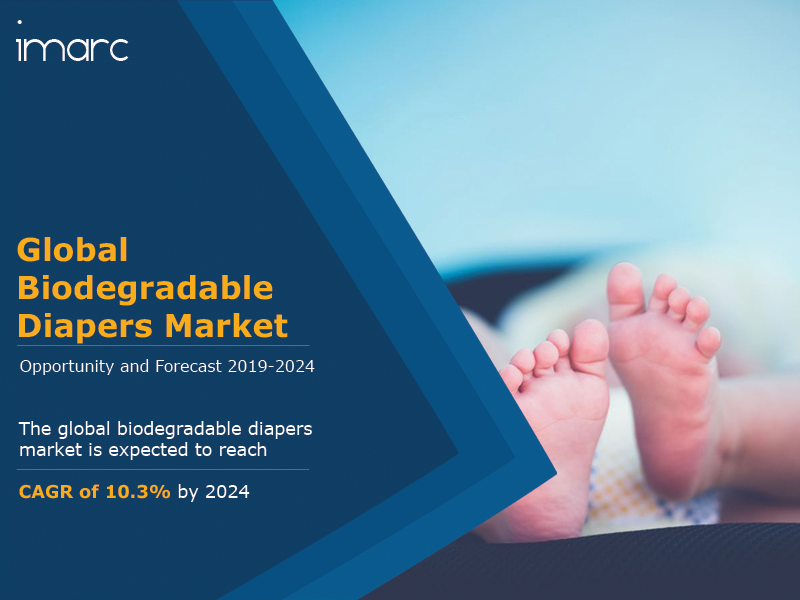 The global biodegradable diapers market is expected to grow at a CAGR of 10.3% during 2019-2024. A diaper is an absorbent item used by babies or adults to defecate and urinate without going to the toilet. They are made from either non-biodegradable petrochemical based materials and plastics or from biodegradable fibers such as cotton, bamboo, starch, etc. Rising environment concerns represents a key factor driving the demand of diapers. Unlike biodegradable diapers, traditional diapers do not degrade well in a landfill. Moreover, they can take around hundreds of years to decompose. The huge amount of untreated waste added to the landfills every year through plastic diapers can also pollute the ground water. Additionally, disposable diapers also consist of several chemicals that can have a negative impact on health. These include dioxins, sodium polyacrylate, tributyl-tin, volatile organic compounds, dyes, fragrances, etc. These chemicals may cause itching and various health problems such as damaged immunity, hormone interferences, cancer, respiratory problems etc. Rising awareness on the negative impact of these chemicals is also driving consumers to shift towards biodegradable diapers which are made up of natural materials. Some of the other major factors driving the market include increasing awareness about personal hygiene, decreasing mortality rate among infants, rising demand for adult diapers, increasing government initiatives, etc. IMARC Group’s latest report provides a deep insight into the global biodegradable diapers market covering all its essential aspects. This ranges from macro overview of the market to micro details of the industry performance, recent trends, key market drivers and challenges, SWOT analysis, Porter’s five forces analysis, value chain analysis, etc. This report is a must-read for entrepreneurs, investors, researchers, consultants, business strategists, and all those who have any kind of stake or are planning to foray into the global biodegradable diapers market in any manner. Cotton/ Wood pulp currently dominates the market, holding the largest share. Baby diapers currently dominate the market, holding the largest share. Pharmacies currently hold the largest share. North America is the leading market, accounting for the highest market share. The report has also analysed the competitive landscape of the market with some of the key players being Earth's Best (Hain Celestial), Bamboo Nature, Seventh Generation, Kimberely-Clark, GroVia, Naty AB, The Honest Company, Ontex Group, Babyganics, Unicharm, Pampur, Flip Diaper, Bumkins Company, etc.